Currently, many states use precipitation information to regulate periodic closures of shellfish harvest areas based on a presumptive relationship between rainfall and bacteria concentration. We evaluate this relationship in four South Carolina estuaries and suggest new predictive models that integrate remote sensing precipitation data with additional environmental and climatic data. Model comparisons using Akaike’s information criterion, tenfold cross-validation, and model r 2 values show substantial and consistent improvements using integrated precipitation, salinity, and water temperature data as predictors. These models may be useful for shellfish area closure regulation support. The model development approaches used here may also be useful in estimating bacteria concentration at beaches and can serve as the basis for developing near-real-time estimates and forecast predictions of bacteria levels for closure decision-making tools. The authors wish to thank Mr. Charles Newel and the South Carolina Department of Health and Environmental Control for their support and guidance in the development of this research. Figure 1 was prepared by Caroline Wicks (www.Eco-Check.org) with symbols prepared by the Integration and Applications Network at the University of Maryland Center for Environmental Science in Cambridge, MD. 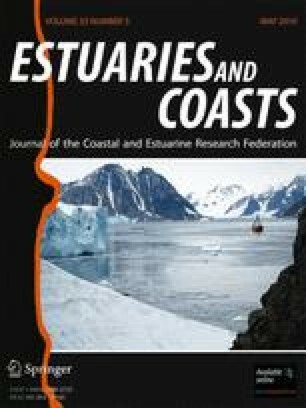 This paper is a result of research sponsored by the NOAA Center for Sponsored Coastal Ocean Research/Coastal Ocean Program through the S.C. Sea Grant Consortium through the following grants: the NOAA NOS-funded Urbanization and Southeastern Estuarine Systems Project (USES) grant no. NA05NOS4261154, and the NOAA NOS-funded Land Use–Coastal Ecosystem Study (LU-CES) grant no. NA960PO113. This publication does not constitute an endorsement of any commercial product or intend to be an opinion beyond scientific or other results obtained by the National Oceanic and Atmospheric Administration (NOAA). No reference shall be made to NOAA, or this publication furnished by NOAA, to any advertising or sales promotion which would indicate or imply that NOAA recommends or endorses any proprietary product mentioned herein or which has as its purpose an interest to cause the advertised product to be used or purchased because of this publication. The US government is authorized to produce and distribute reprints for governmental purposes notwithstanding copyright notation that may appear hereon. This manuscript is contribution number 1598 of the Belle W. Baruch Institute for Marine and Coastal Sciences, and University of Maryland Center for Environmental Science contribution number 4381. National Center for Environmental Prediction (NCEP). 2002. NCEP STAGE II DATA README FILE. http://www.joss.ucar.edu/data/gcip_eop/docs/katz_stageII_readme.txt. Retrieved September 6, 2005. National Digital Forecast Database (NDFD). 2004. About the NDFD GRIB2 Decoder. http://www.nws.noaa.gov/mdl/NDFD_GRIB2Decoder/. Retrieved September 6, 2005.